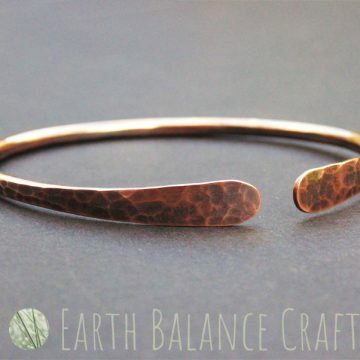 A distressed metal stacking bangle with a lightly hammered face that has a darkened patina. Hand-made from copper wire with a rustic Bohemian feel, with a minimal style and warm metallic highlights. The women’s bracelet design has a small decorative opening where the ends of the wire have been flattened into soft paddle shapes. Variation: Each piece is hand-crafted individually and will vary slightly in appearance. When ordering you will receive a replica of the design shown. This design is not one of a kind. The photographs in the gallery show a number of versions of the design on multiple backgrounds to give the most true to life image. Metal: Size 3.0mm (9ga) solid copper wire with a patina finish polished to reveal the warm coppery tones beneath. The copper has been sealed with Renaissance wax to reduce down the natural patina that occurs over time. It can be buffed with a cloth to restore the glossy highlights. 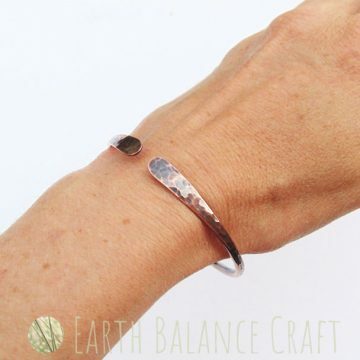 Fitting: Please note this design is styled as a bangle, the opening is not designed to be placed through the side of the wrist like a cuff bracelet. The metal has been work hardened to retain the shape for longevity. Please do not attempt to open/adjust the size of the bangle as it will not take excessive movement. It must be fitted by sliding over the fingers/knuckles onto the wrist area like a closed bangle. Measuring Guide: If you do not have a bangle to measure, it can be difficult to buy the right size online. If your wrist size is much smaller than the broadest part of your knuckles then the bangle may fit too loosely on the wrist, even if the measurement over the knuckles is the right size for you. Read this guide for more information. 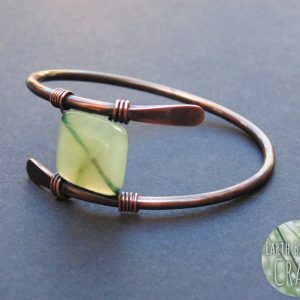 A raw copper bracelet designed as arthritis jewelry. The copper has been shaped to follow the curve of your wrist and lightly hammered with warm copper colours and metallic highlights. The ends of the wire have been formed into paddle shapes which add a softness to the design. The style is right at home alongside other metal stacking bangles. This women’s bracelet moves away from the traditional and classic bangle style of arthritis jewellery with a modern and minimalist feel. 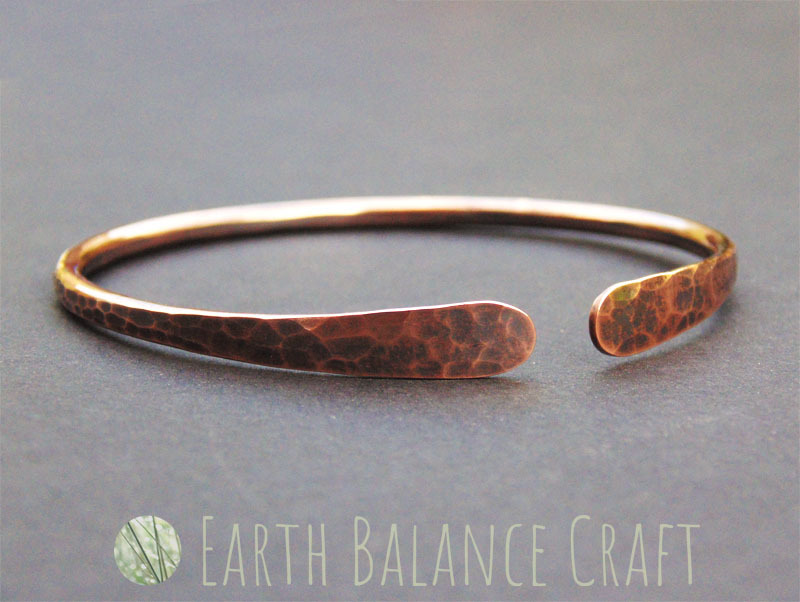 A rustic chunky copper wrap around metal bangle with a textured face that has a darkened patina finish. This women’s design has a minimal style, dappled textures, with warm coppery tones and metallic highlights. 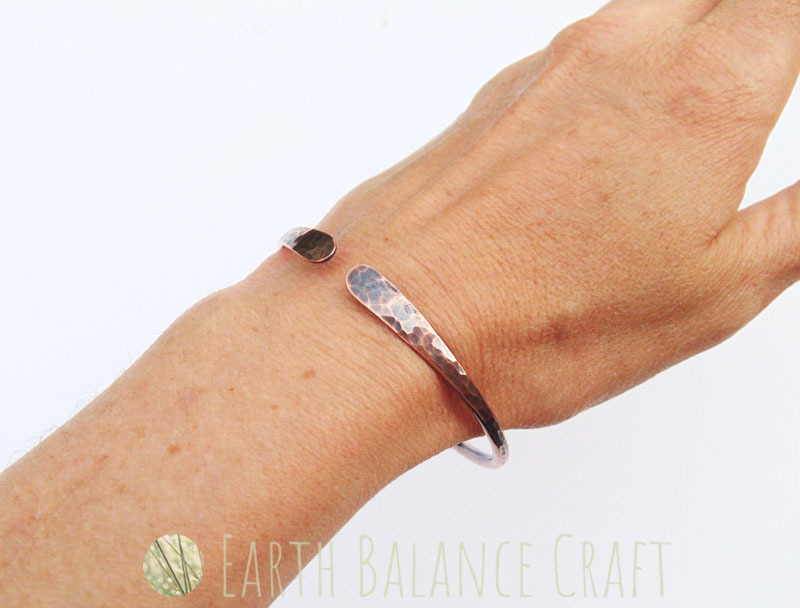 The copper has been shaped to follow the curve of your wrist and lightly hammered for a weathered and distressed appearance. This gypsy styled leather wrap bracelet features a honey colour palette of citrine, lemon jade and agate beads. The design features a curved beaded copper bar, with rustic antiqued leather and hand forged copper and gemstone droplets. The design is inspired by the height of summer, with bees busy collecting pollen ready for making honey.